Social, video, and messaging apps now occupy a fair share of the content landscape -- but with over 3.5 billion searches per day on Google alone, search is a channel marketers still can't afford to ignore. 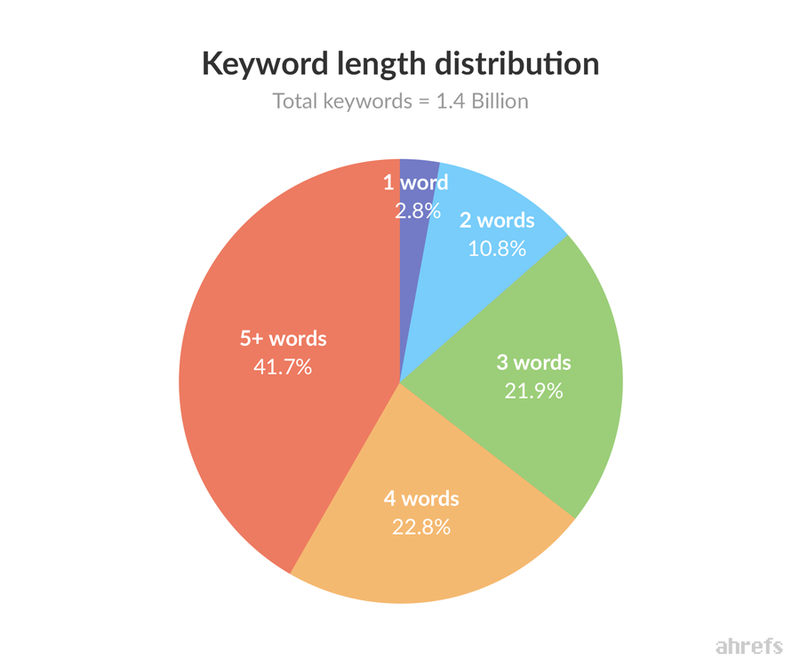 Over the last ten years or so, it feels like we've figured out a pretty standard content formula: publish a large volume of content to target long-tail keywords, and convert that organic traffic into leads via gated content offers. But this way of thinking about content has hit a wall. Search has changed, and it's time content did too. Back in 2006, search behavior was relatively simplistic. We typed at search engines with queries like, "Restaurants Boston," rather than talking to them conversationally. Today, the average search query goes something like, "Where is the best place to eat near me right now?". This isn't because we've suddenly become comfortable talking to robots. It's largely because the quality of results that search engines serve has substantially improved, along with the quantity of content. We've learned the playbook and have published so much content, some marketers say we've hit "content shock," and that producing content at this rate is no longer sustainable. While the quantity of content has dramatically increased, quality has not. Sure, there are individual publishers and sites that create amazing content you probably consume regularly. But for the most part, a lot of content published today doesn't contribute much to the conversation. In addition to our search behavior, the general way we use the internet to interact with sites has changed. We've shifted from desktop-based PCs, to mobile laptops, to smartphones as mini-computers in the palm of our hands. We're going to focus on Google-specific updates here, since between their core search, image search, and YouTube, they collectively control 90% of the search market. When Google first popped up on the scene, the way they returned results was to essentially deconstruct queries into their fundamental pieces -- meaning individual keywords that appeared -- and serve results based on exact matches. At that time, marketers who stuffed matching keywords into content would naturally rank for the query, until Google started adjusting their algorithm. Let's walk through three of the most important Google search updates and how they impact your strategy. Penguin Algorithm Update -- Rolled out April 24, 2012. This algorithm update was designed to penalize "webspam" and sites that were over-optimized using black-hat SEO techniques. Webspam --such as keyword stuffing and link schemes -- was penalized in this update, with 3.1% of English search queries impacted. 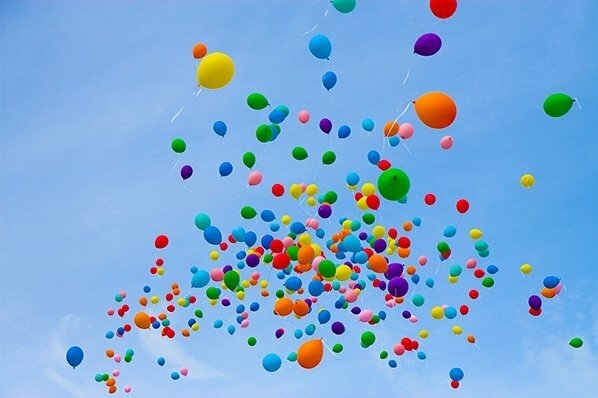 The takeaway: Include relevant links and keywords in your content, but don't overdo it. While there's no magical number that's right or wrong, look at your content through the lens of a reader and make a judgment call if it's too much. Hummingbird Algorithm Update -- Announced on August 20, 2013. For example, if you search for "what's the best place to buy an iPhone 7 near my home?" a traditional algorithm before Hummingbird would have taken each individual keyword and looked for matches. With Hummingbird, Google began to look at the meaning behind these words and translate them into a better result. Digging into that example query above, "place" means you're looking for a store you can physically go to, instead of a website you can buy from. Hummingbird looks at the entire query and attempts to understand the meaning behind the words used to return relevant results. The takeaway: We now search the way we talk. Focusing only on keywords means you're likely missing out on traffic from conversational search. 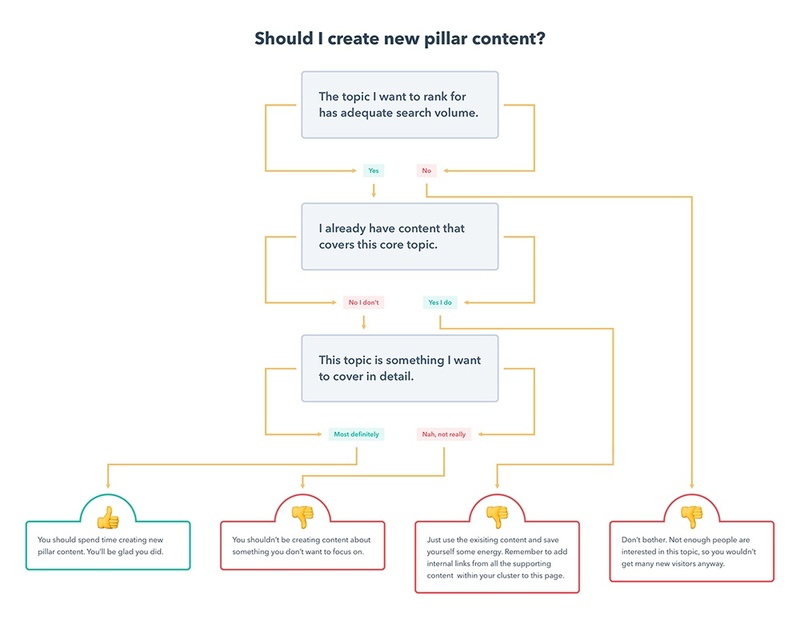 Start thinking about clustering your content into topics, and adjusting the way you create content with pillar pages. RankBrain Algorithm Update -- Announced on October 26, 2015. It's important to understand that there are over 200 ranking signals when Google evaluates a page. When RankBrain was announced, it immediately became the third most-important factor Google uses to determine rank. So, what does RankBrain do? At a basic level, this algorithm helps interpret searches to find pages that might not have the exact words searched for. For example, if you search for "sneakers," Google understands that you might have meant "running shoes" and incorporates that factor into results. The takeaway: Searchers are likely discovering your content even though they don't use exact keywords. When you combine this update with Hummingbird, the evidence is clear that we need to shift how we think about, plan, and create content. No -- keywords are still very relevant today. Yet many marketers solely rely on keywords to inform their content strategy. With the search behavior and technology changes we've discussed, your future playbook must be based on the overall topics that match the intent of a searcher, and the specific keywords they use. For example, if you want help companies redesign websites, then you would naturally want to appear on a search engine results page for the keyword "website redesign." In this case, "website redesign" is the overall topic. But some users might be really be searching for "redesign existing website", which is essentially the same query with different keywords. 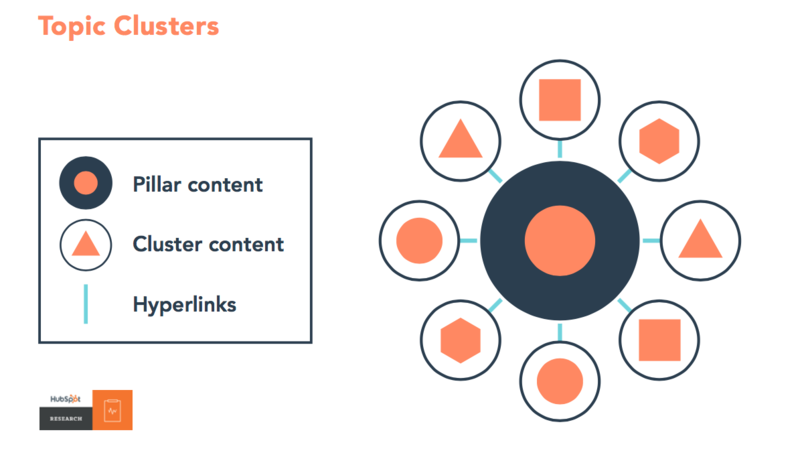 "The basic premise behind building a content program in topic clusters is to enable a deeper coverage across a range of core topic areas, whilst creating an efficient information architecture in the process." Instead of thinking about every variation of exact keywords, think about the topics you want to be known for, and the content you create will deeply cover that topic. Then, within this topic-based content, include relevant keywords. 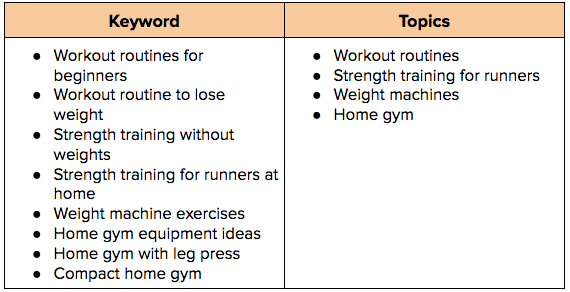 To explain this further, let's break down topic vs. keyword in the table below. A topic cluster should be specific to the topic you want to be known for and should be short -- ideally between two and four words. 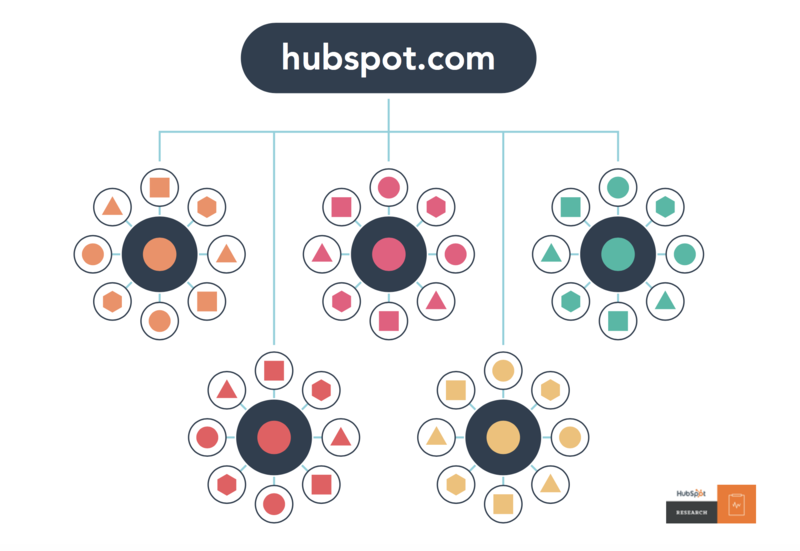 For example, at HubSpot "inbound marketing" is a topic cluster, and we have pillar content dedicated to describing the methodology. You can have numerous topic clusters across your site for as many topics as are relevant to your company. Pillar content is central to this new strategy. It is typically comprised of a single page -- such as a website or landing page -- that offers a comprehensive view of the topic. Ungated - Pillar content should be ungated. That is, all of the content should be available for search engines to crawl and visitors to read without having to fill out a form. You can have a form on the page, but just don't hide content behind the form. Comprehensive - Pillar content should be comprehensive, which also generally means long-form. 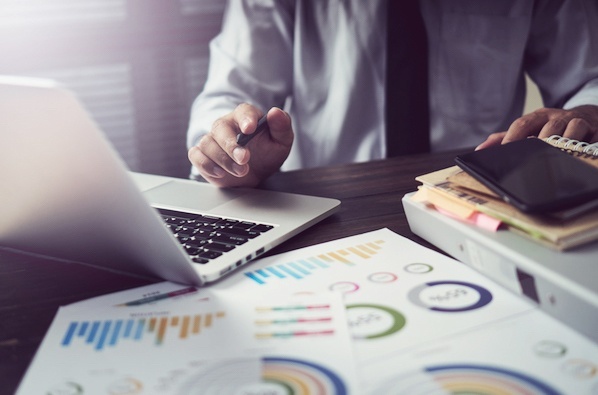 Consider all of the questions your sales, services, and support teams regularly receive concerning a specific topic and build in answers within the page content. Related terms - Remember when we talked about the algorithm updates above? Be sure to mention your core topic a number of times on the page, but also include synonyms as well. That way, no matter how someone searches for that topic, they'll hopefully land on your page. This new approach helps you attract more traffic from broad topics, and still captures long-tail keyword based traffic as well. It's a solution that is better for your visitors, and allows you to provide answers they expect to find without encountering technology hurdles. As marketers, it's up to us to create valuable content people actually want. Content that is helpful, human, and easily found. Ultimately you want to achieve your goals -- whether that's increasing traffic, leads, or MQLs -- but it all begins with content that matches the way people search, and the way search engines work today.